We’ve long had the vision of incorporating fruit trees into the Radix system. Fruit trees and perennial crops are an important component in a sustainable urban food production system. By producing food overhead, they make efficient use of vertical space, and can produce a yield year after year with only a minimal initial investment. 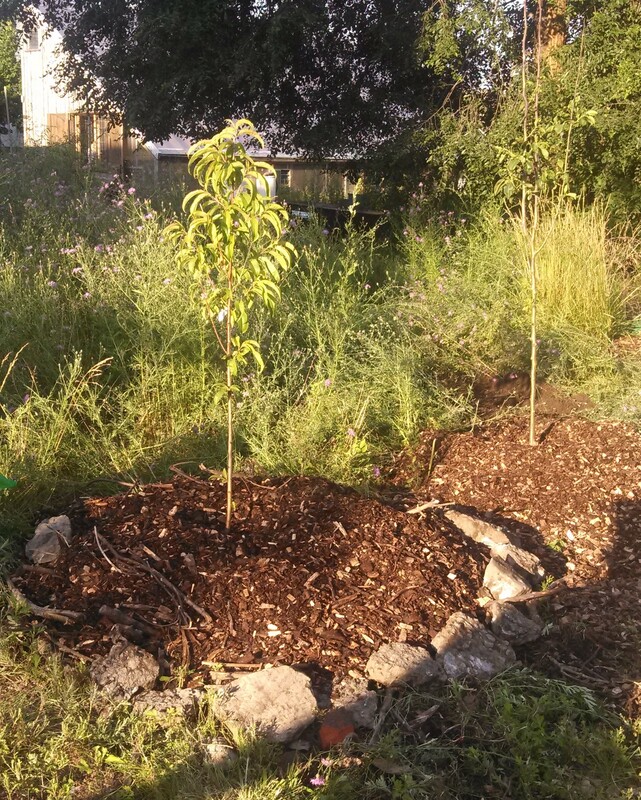 In early July we found fruit trees that were 70% off – so we bought 5 and decided to have a planting workshop. A significant limiting factor on our site is an almost complete lack of soil and limited water availability. Both were solved by preparing hugelkultur mounds – essentially piles of sticks and woody debris mixed with soil, compost and wood chips that allowed us to plant the trees in areas with shallow soil. The mounds make excellent moisture reserves, thereby reducing the need for supplemental watering. Click here for a description of the workshop by our summer intern, Melissa Chilinski.